After a hectic start to the summer holidays this last week we have taken it easy and had plenty of days in the garden and walks up to our local park. We’ll still get a few more days out in before we go back but it’s been nice to get up and take our time over breakfast, the boys have got dressed and been the in the garden pretty much all day and we can potter around or sit outside and watch them tire each other out. After a few days out I am always ready for a day at home, then after a few days at home we are recharged ready for a good day out. On Wednesday we had a BBQ with the boys’ cousins; our garden was full of all kinds of toys, the sun was shining and they all had so much fun together. So much fun in fact that the twins refused to nap as they didn’t want to miss out! It is so nice that we can just go with the flow in the holidays and if they don’t nap we can all cope, it also means an earlier bedtime which is something to be enjoyed. This week’s Living Arrows photo is one of Bear; we had five boys under five in our garden for the BBQ which was crazy but I love that they all play together then go their separate ways and quietly play on their own. I thought everyone was chasing after bubbles but I turned round to see this little one sat in the sandpit quietly filling pots with sand. He has the sweetest temperament, so laid back and thoughtful and while he loves to play with others sometimes he will happily get lost in his own games. He’s a lot like Lucas but without the temper! This holiday I feel like I’ve really had the time to watch them all and see how they interact and I’m understanding all their differences more and more. If I can’t see the twins front on I can still usually tell who is who from their actions. 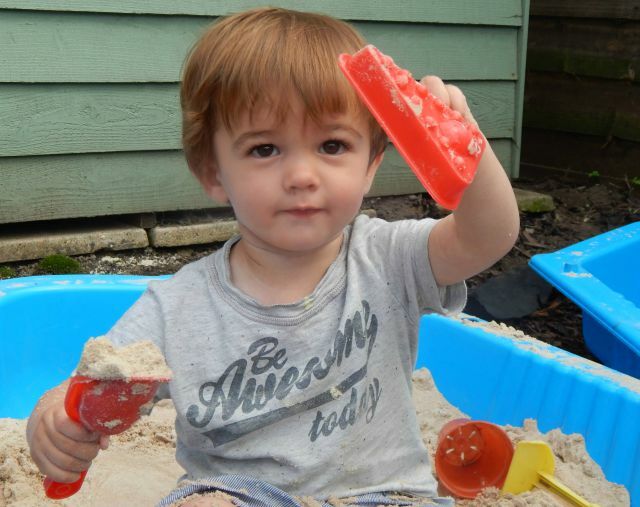 When I saw him sat on his own in the sandpit, quite cheerful and focused on his game I knew before he looked up it would be Bear. My heart melts as I sit and watch him play and I realise I don’t need anything more than this. Aww he is completely adorable and sounds like he has the sweetest personality. I guess he will become your calm and cool one? :). We love a day to potter about at home. I sometimes forget to do that as I always feel we should have a “plan” for that day. His little face looks so much more mature and distinguished here! His shirt says it all about him. Lovely! Bear looks SO like you in this picture, Hayley! Your nose, your eyes. You do make such gorgeous children.